Susan has led a life that seems like a Hollywood movie. She fell in love with her best friend, got pregnant, married and miscarried their only child. Later she discovered that her husband was homosexual with multiple partners, and ultimately died of AIDS. I met Susan when she reached out to me on Twitter. Her story was so unique that I had to learn where she found her resilience. Susan and her husband Jeffrey met in Grade 5. Their close friendship turned into a love that would last a lifetime. “I always say that I had a friendship from heaven and a marriage from hell,” she tells me over the phone from Florida. She compared their partnership to Bill and Hillary Clinton, as they were always a team and there for each other. When Jeffrey came out as being gay, she said that God spoke to her to keep her vow “till death do us part.” She never considered leaving him. In 1981 Susan was watching the news when a story came on about a disease that was killing gay men. In 1991 Jeffrey showed symptoms of having HIV. He was hospitalized for pneumonia in 1992 and at that point, Susan hit rock bottom. With the stigma associated with AIDS at the time, Jeffrey was put in isolation. To help herself cope she kept a journal, filling 15 books. Twenty-four years ago Jeffrey passed away. Since his death, Susan hasn’t stopped campaigning for HIV and AIDS testing. “Jewish people love to tell stories,” she says. “I am a storyteller.” She published a book titled, “Committed To Love”. At 72 years of age, she shows no signs of slowing down. 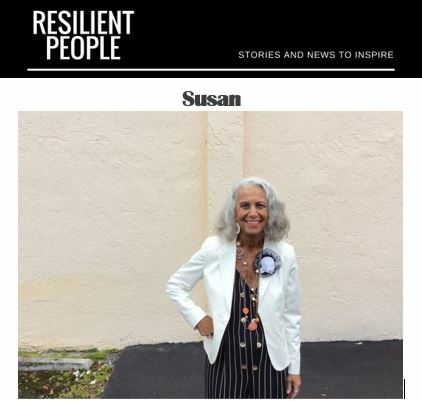 She is a tireless advocate for HIV and AIDS awareness as well as hospice care, has written two books, runs a website, www.susanmintz.com, campaigns for her story to be made into a movie, and speaks to groups regularly on the importance of early detection, knowing your status and treatment options.